This struggle is why I recently read a book called Prayer: Does It Make Any Difference? by Philip Yancey. I’d picked it up about a year ago and it’s been staring at me from my bookshelf ever since. I highly recommend you read it, even though it really didn’t answer my main questions about prayer. Instead, it shifted how I think about prayer. The Bible does talk about people fleeing from the Lord’s presence, leaving His presence, or being unable to enter His presence. And since we’re told “seek Yahweh while he may be found. Call on him while he is near,” it seems that there are times when He cannot be found and is not near (Is. 55:6, WEB). We’re also told our sins can block relationship with God (Is. 59:2). But that doesn’t actually mean He’s not present. We don’t have to make God show up. We have to learn to respond to a God who is already there, listening and waiting for people to turn to Him. When we can’t feel Him it’s not because He’s gone missing. It’s either something that we’ve done to move away from Him, or we’re simply at a low point in our walk with God. Even Jesus Christ called out, “My God, my God, why have you forsaken me?” although He’d never done anything which would have made the Father remove His presence (Matt. 27:46). God was still there, but Jesus couldn’t feel His presence. And sometimes it’s the same with us. But we keep praying anyway because we have enough trust and faith to keep responding to His presence even when we don’t feel it. 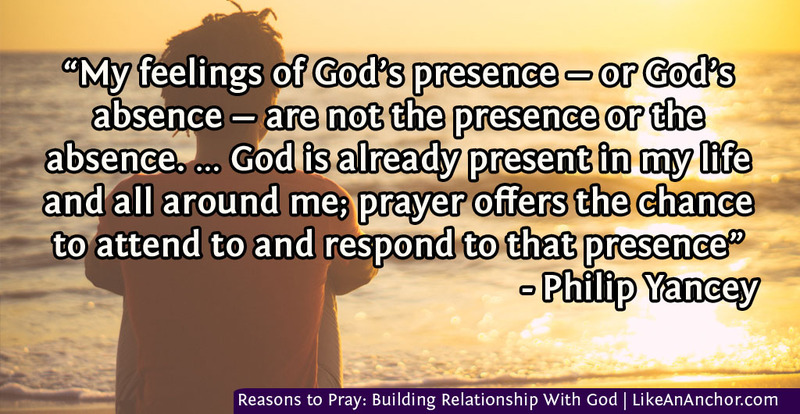 Prayer is a key part of building relationship with God. We see this clearly in the example of David, the man after God’s own heart. He enjoyed a close friendship with God and it shows in the prayers we have recorded as Psalms. David’s faith wasn’t a stiff, formal religion. He worshiped God with boundless enthusiasm and reverent awe, with thanksgiving and request-making, with joy and with heartbroken tears. David didn’t worry about whether or not God wanted to hear about everything going on in his life. He just prayed, even when the prayer was one Christ would quote: “My God, my God, why have you forsaken me? Why are you so far from helping me, and from the words of my groaning?” (Ps. 22:1, WEB). David knew even when he didn’t feel God’s presence that God was still listening and still cared. As Yancey comments a few chapters after this quote, it seems evident that “God likes to be asked” (p. 143). He already knows what you need, want, and care about. However, He still wants to have conversations with you about it. 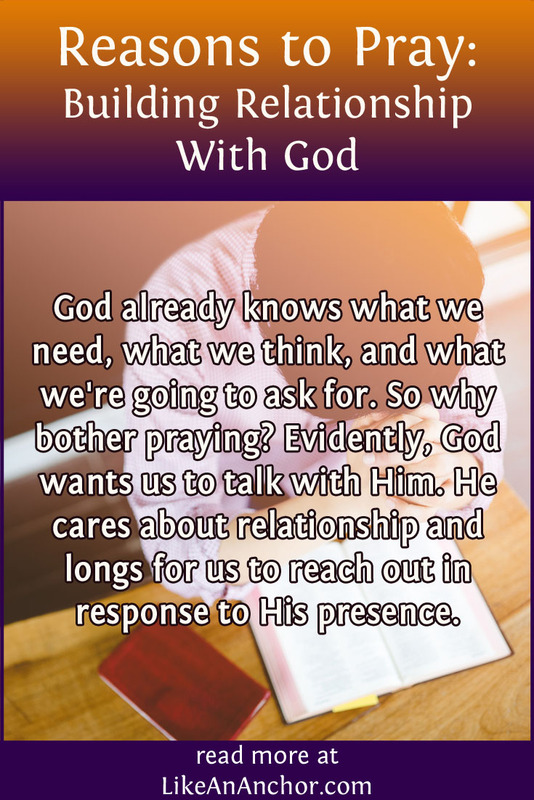 He wants the relationship that is built when we pray, even if its blundering, uncertain, questioning, or worried prayers. He knows relationships are built with communication, not with us hoping He’ll read our minds and give us what we want. Have you ever thought about what our freedom might “cost” God? He’s given us the liberty to chose obedience or sin, to welcome Him in or to reject Him. He doesn’t demand we do what He wants. He asks. 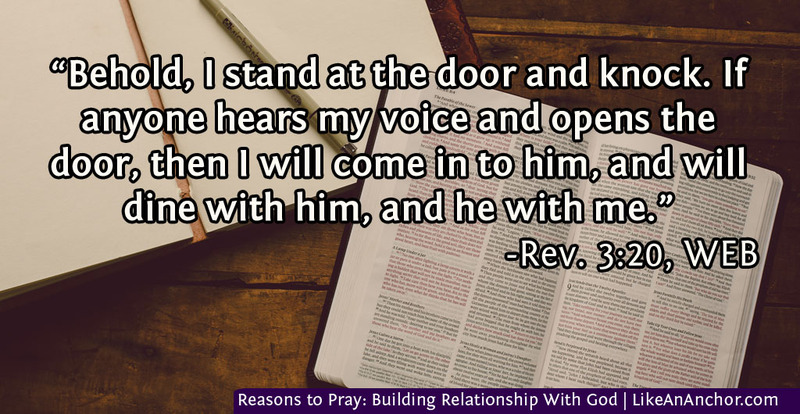 In the words of Matthew Henry, “He sues for entrance who may demand it; he knocks who could easily knock the door down” (commentary on Song 5:2-8). You can’t have a real relationship, at least not a good and healthy one, with someone who doesn’t give you a choice whether or not to be with them. So God knocks on the doors of our hearts, asking us to welcome Him. He dwells in us through His spirit by permission, and asks us not to grieve or quench His presence inside us (Eph. 4:30; 1 Thes. 5:19). Prayer is one of the best tools we have for opening up our lives and letting Him know He’s welcome. God wants us to feel welcomed in His presence, and to keep coming back. He wants to get a dialogue going and build a friendship with us. He’s taken the first steps in this relationship by giving us His word and by Jesus living and dying to reconcile the breach between God and humanity that was caused by sin. Now we need to respond. God wants us to ask, seek, and knock looking for Him, just as He does while looking for a relationship with us (Matt. 7:7; 11:28; Ezk.34:11; Rev. 3:20). That’s one reason we must never give up on prayer. God communicates with us through His word and His spirit, and we communicate with God through prayer and our spirit’s response to His. We build our communication skills with practice, bringing our honest selves to God the way that David did. Click here to get a copy of Prayer: Does It Make Any Difference? by Philip Yancey . Please note that this is an affiliate link. This means that, at no additional cost to you, I will receive a commission if you click on the link and make a purchase. ← 5 Signs You Might Not Be an INFJ – And What You Might Be Instead! That first paragraph sums up how I feel about prayer too! Now I have plenty to think about. Thanks for writing about this! I think a lot about how God treats us, including the costs he has incurred pursuing a relationship with us. It’s a good example for me in dealing with my children and the relationships He’s brought into my life. Thanks for the post! Good thoughts!